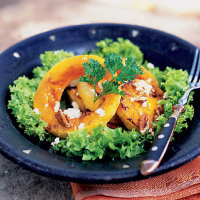 Pumpkins and squashes are popular in South Africa and are great for a braai – when they caramelise, they become sweet and more intense in flavour. The saltiness of a crumbly Feta and the crunch of the nuts provide excellent contrasts. Preheat the barbecue well in advance. Cut the squash into 1cm slices and deseed. Toss in 1½ tbsp olive oil and season. Cook on a rack over medium coals with a moderate layer of ash for 4–5 minutes on each side, until tender all the way through. Arrange the salad leaves on plates. Add the cooked squash on top and sprinkle with the cayenne pepper. Squeeze over the orange juice and drizzle with the remaining olive oil. Gently fold in the pecans and Feta and check the seasoning before serving.